What a privilege to race again in this years London nocturne. For one day streets around the city are turned into and 1.5km course with a real carnival atmosphere as many races take place. From Santander bikes through to professional riders, our race was sandwiched somewhere in the middle. After a warm up lap the 9 teams of four riders compete over 8 laps. With so many tight turns and shirt straights it tests your speed, control and endurance as you Sprint as fast as you can through the whole course. Looking good in our new Jerseys the team (despite and total lack of training) finished a respectable 5th. More importantly we lived it, exhausting as it was, the roar of the crowds and the thrill of the race were exhilarating! Next year we train and prepare! Sign up to join the club if you fancy joining us. As we hit the colder months, you would think that riding will stop, well were hopeful we can keep going as much as possible and get people out riding regularly from learners to club riders and everywhere in between. The learn to ride sessions have been really well attended at the Linc Centre with a group regularly turning up even in the rain to learn new skills or refresh long forgotten ones. Great to see a group heading out this week as well even though there was no planned lesson, they just wanted to ride, which is what we are all about. Keep you're eyes on the events page for up coming lessons extending to the Aberfeldy estate after the half term. A few of us headed over to Bespoke Cycle shop at Canary Wharf last night for the chance to ride on really expensive bikes whilst racing against each other on an interactive trainer called Zwift. With four bikes lined up and a 9km course ahead tension was high as three Peddlers vied to be King of the Mountain and get the fastest time on the night. It was a really fun event and Zwift is a fun way to exercise through the winter months, but you will need a turbo trainer and an internet connection to make it work. The guys at Bespoke put on a great show and showed great hospitality. They have really encouraged us to develop the club and staff members have joined us on weekend rides. And finally the new club shirts arrived this week and caps and T-shirts so they will be available on the website soon. The Shirts are really great quality and huge thanks to Blackmore for working with us to design an eye catching Jersey that we hope to see out on the road more and more. All proceeds will be ploughed back in to the club. The first part of the ride was undoubtedly the most nerve-wracking, navigating our way through the backstreets with its pedestrians, overtaking cars and parked vehicles. There was a leader at the front and back, whilst the more confident riders snaked alongside the group checking if all was well – which it was. We cycled to Victoria Park, and once we were away from our fellow motorists, we all began to take in the relaxed atmosphere a bit more; letting the breeze guide us along whilst soaking in the sunshine that was out to greet us. We moved from the park to the canal before reaching the Velo Park. There were a few wobbles near the canal, space was tight but everyone did so well. Once at the Velo Park the anxiety started to build again as we got ready to take on the track (by anxiety I really mean excitement!). The tarmac was smooth, and after getting up the initial hill the momentum gathered from going downhill was thrilling. It did not take us long to fall in love with the track. Admittedly other cyclists were flying past us, lapping us a few too many times, but I felt like I was Hussain Bolt on two wheels. I can remember a few months ago we were all still learning how to ride a bike, and most of us hadn’t been ridding since childhood. And to see us now all zooming around the Velo Park track laughing and trying to master the gears is a massive achievement. The weather was warm, the track was long, we were excitable, and by the end of the session we were exhausted. Chatter and jokes ensued on the leisurely ride back. Needless to say the ride was a success, and with summer around the corner can’t wait to do it all again very soon. Quite often we have ideas of things that we believe will help communities grow together, Poplar pedders is one of those ideas. Cycling is a great way to keep fit, to get around London for free and I am beginning to realise more and more a great community of people. As we discussed ideas around the Peddlers and started to train to 20+ women who have learnt to cycle already this year, we also started to look at ways we could attract people who may like to race, or do longer rides, but who share our vision of getting people cycling together, talking together and generally creating a club that embraces all types of cycling, because to create great communities we need to embrace people from all backgrounds. 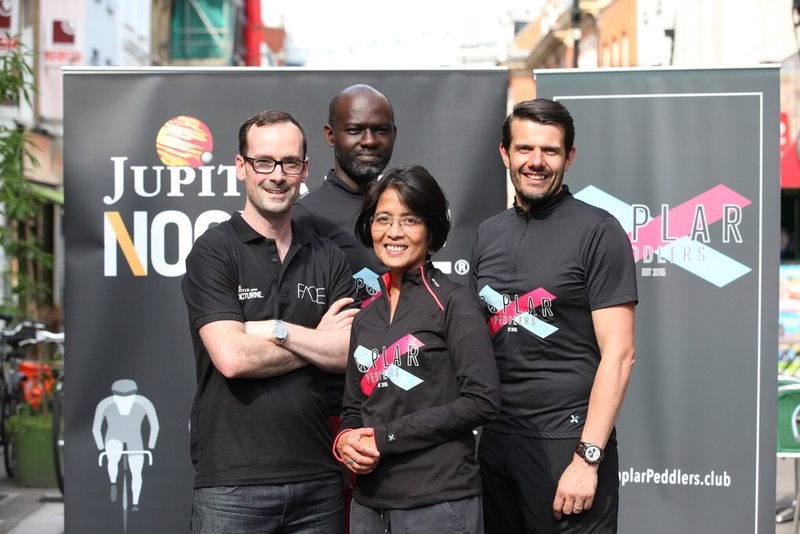 Last night our first Poplar Peddler team went to the Oakley in residence pop up shop in Exmouth Market along with many other keen cyclists to register for our first race, the Jupiter London Nocturne, courtesy of Face Partnership who organised the event. We have already seen again and again that the cycling community welcomes new people and wants to support initiatives that get people cycling so we were grateful for this opportunity. Still not sure of this was a good idea the night before the race! Tonight we race for real at Smithfield Market, and hopefully I'll still be able to type to update in that later on. We are so grateful for this opportunity but I can't stress enough to this isn't the end game for Poplar Peddlers, whilst excited at the adrenaline rush I know will come at racing, I get more excited seeing Sunara, another member (who sadly couldn't make the launch) Learning to ride and then going on straight away to qualify as a cycling trainer, I love the fact that we will be running rides into the Queen Elizabeth Olympic Park from Poplar or down to Tower Bridge, opening up the world of London, the amazing sites and a more active lifestyle to many people. If you're interested in joining us then do get in touch, we are new and we my be a little different but we love cycling and we love people so you will definitely be welcome! Poplar Peddlers is a new Cycling club, aimed at developing a cycling community in and around Poplar East London, Road, BMX or Mountain bike, beginner or expert.